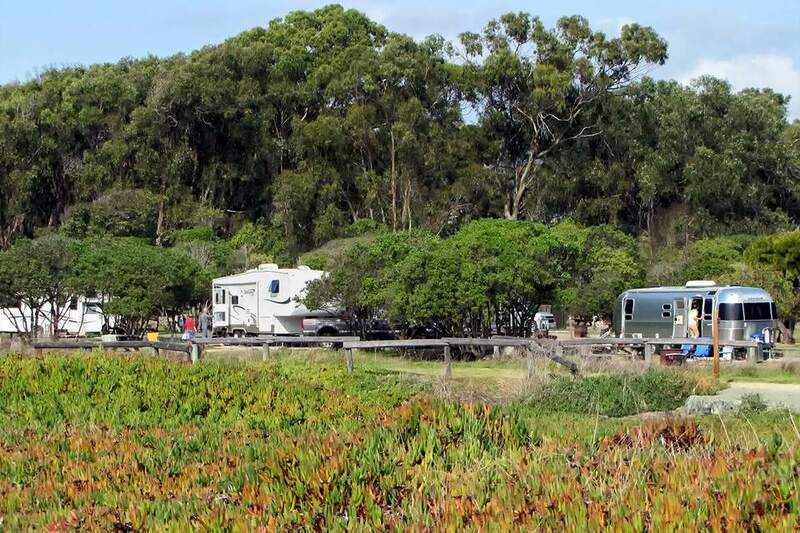 This large campground near Pismo Beach is spread out and has lots of room between sites. It's close to the dunes and the beach (and to town) but is protected from the wind. Most of the sites are grassy. The campground has direct beach access but is not on the beach itself. The campground is very popular with families and gets super busy in the summer. Peak camping season runs from the middle of May to the middle of September. You may have trouble finding online reviews of this campground because it goes by several names. On Yelp, they call it North Beach Campground. Most people who write reviews of it on Yelp really like it but read carefully. Some of them are actually reviewing the town and not the campground. Pismo State Beach has two campgrounds. The other one, Oceano Campground is about a mile away. If you think it would be fun to stay at this campground but you don't have an RV - or don't have yours with you - try Luv2Camp. They're a vacation trailer rental company that will deliver and set up your RV for you. It doesn't get much more convenient than that. What Facilities Are There at Pismo State Beach North? Pismo North has 103 sites for RVs and/or tents, with no hookups. It can accommodate campers up to 36 feet long and trailers up to 31 feet. Some sites have trees. It has restrooms and showers, and WiFi is available within 150 feet of the restaurant at the Le Sage Day Use area, about 3/4 mile from the campground. There's a nature center in the park. Walking trails lead to the adjacent monarch butterfly preserve and there's easy beach access. Dogs are allowed on leashes no longer than 6 feet. They must be inside a vehicle or tent at night. The two campgrounds in Pismo State Beach are both visited by a service that brings water, provides pump out service and sells ice. You'll also find firewood for sale in the park. There are four restaurants within 2 blocks of the campground, in case you don't feel like cooking. Some campground visitors say sites around the perimeter are best, especially near the butterfly preserve and the ocean. Others say that sites on the ocean side are too windy. If you bring more than one vehicle per campsite, you'll have to pay an extra fee. And you can't bring more than 3 vehicles per site, even if you are willing to pay for it. Reservations are a necessity on weekends and during the summer. Make them as early as you can (which means 6 months ahead). Learn about how to make California state park reservations before your trip. Reserve your spot at the Pismo State Beach reservations page at ReserveCalifornia.